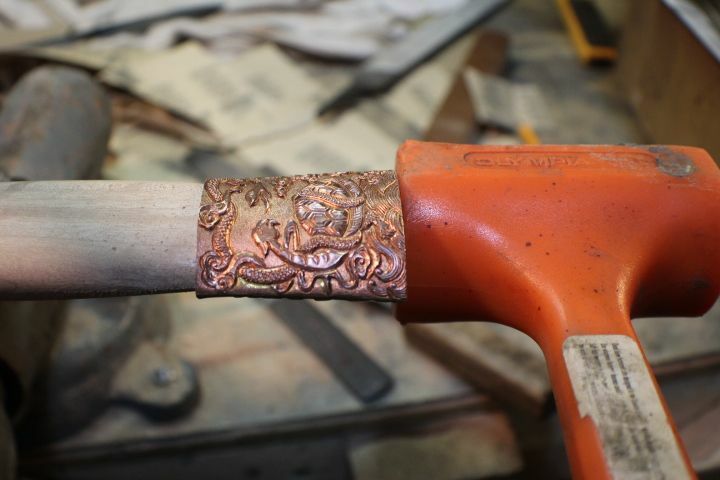 This one is still in progress (there is a longer thread in the Custom Knives forum showing the process). 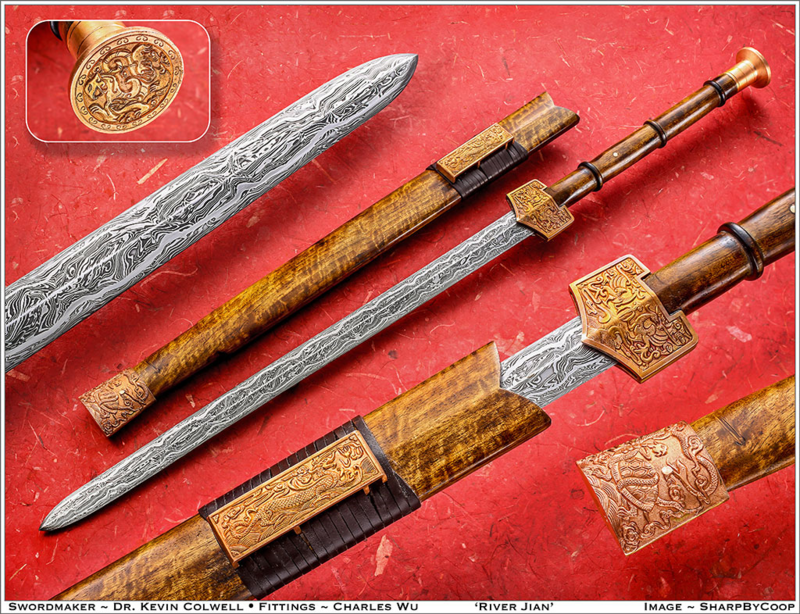 Here is the guard, made by Charles Wu. The handle is just rough shaped at present. 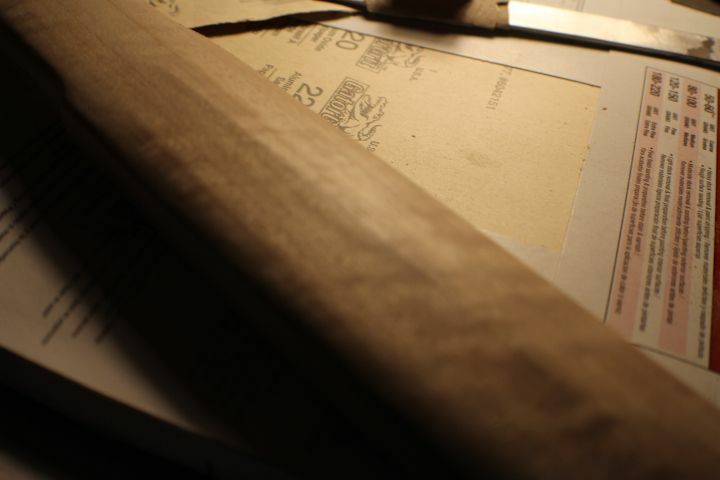 Scabbard is also only roughed out. However, the blade is done! here is a shot of the River pattern. The tip. It is a little pointer now than it was in this photo. Blade is 21.5" long, 1.25" wide, and .27" thick at forte. Tang is 10" long. Starting to look real good Prof.
thanks buddy. I have a little more progress, but I am waiting until a get a decent amount together before I post more pics. 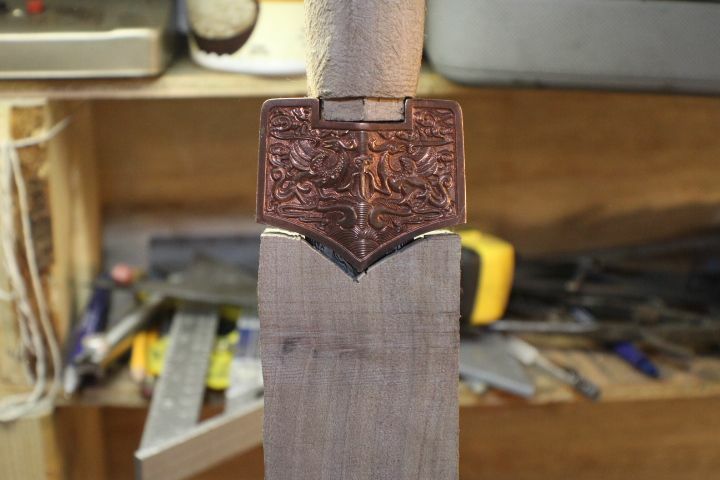 slow going on this sheath. Good luck . I know it gets exciting when it all comes together . That's when you take your time and think about the blade... visualize what it will look like . Its my little meditation thing . The slower I go the better piece I make . I am quite sure everyone has their own blade mojo. Your blade looks to have a real nice " Chinese look" Some folks don't think about correctness when calling a blade " something" yours is spot on. Been awhile, but I am still working on this one. Almost done. Hopefully over the next 3 days I will finish. 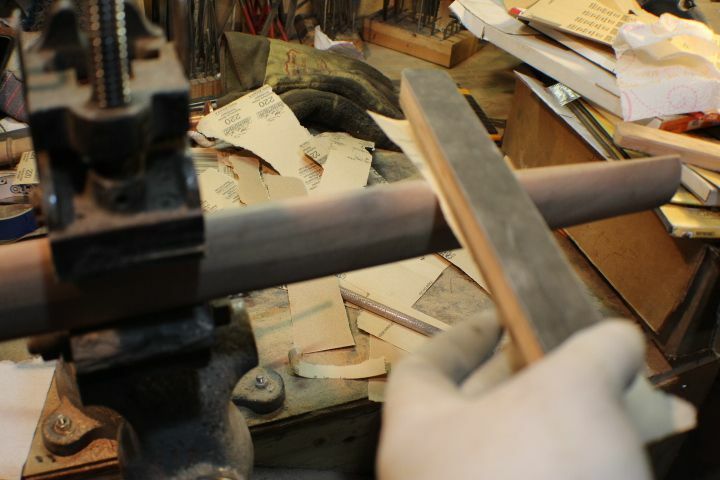 Here I am sawing the lines to then chisel between for an mounting for the scabbard slide. 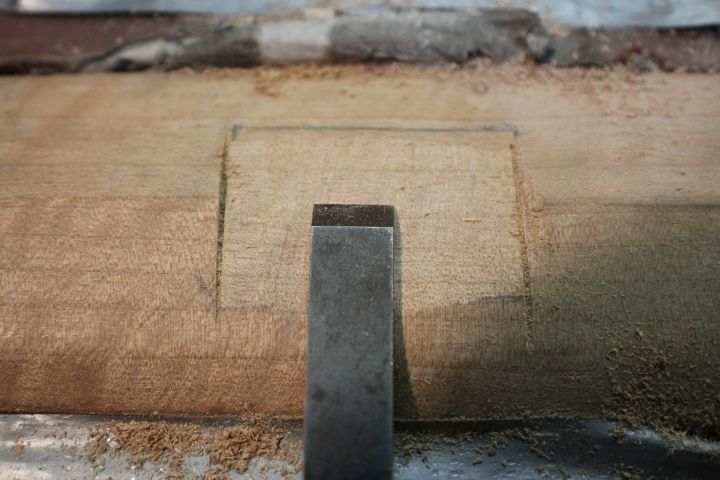 Using a Braun Block (from Ed) to sand the sheath. 100 grit paper and good backing, to get all the dips and stuff out. 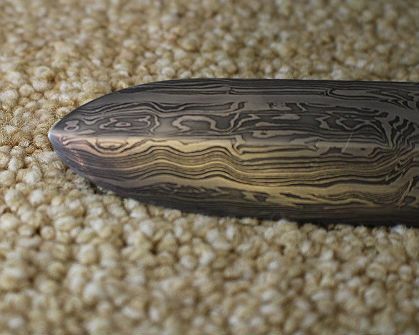 These sheaths have a central ridge for most of the length that transitions to an oval near the chape. Vise with neoprene on the jaws in a bullet vise, Braun block to sand. 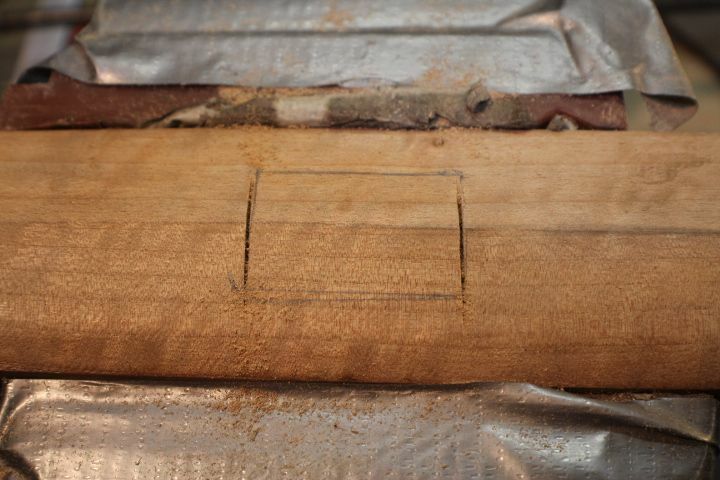 You can see the marks, where wood needs to be removed (and sometimes exactly opposite of there). 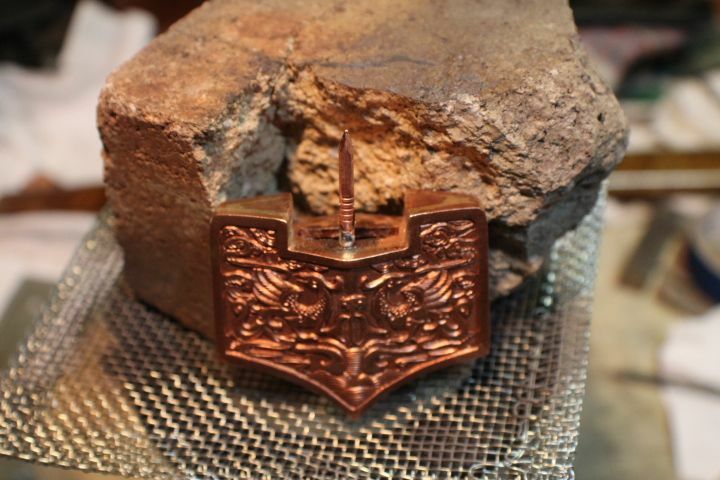 I soft-soldered (stay-brite) a hidden pin made from a copper nail into the guard. This is to make ultra-sure that the guard can't rattle, come what may. Matching pinhole on the handle. Normally, you braze a ring to the guard, and then have the handle come inside that. This can keep the guard from moving. But, with these fittings, there wasn't enough room to use a ring like that, and have a tang that was very wide/thick. 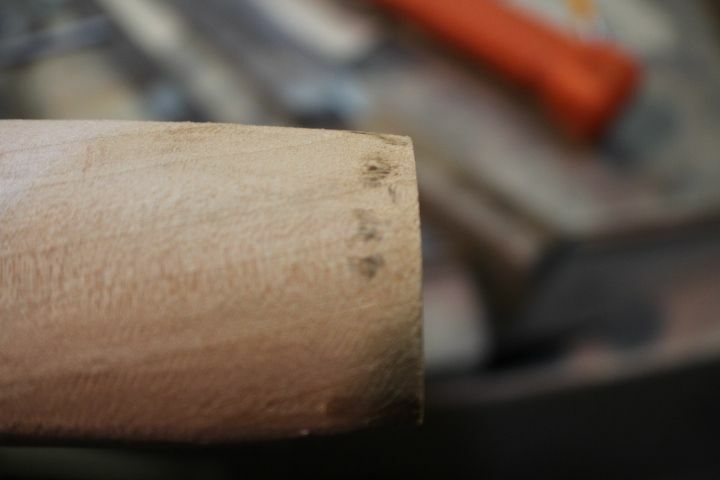 Therefore, I abandoned the ring, and you can see even the wood doesn't take up room on the sides of the handle. That leaves max room for tang, and the pin will take care of making doubly-certain that the guard can not rattle. Surface prep for epoxying scabbard slide. I feel like a criminal every time I do something like this, but I just had to put a pin through Charle's beautiful chape. That's it for now. 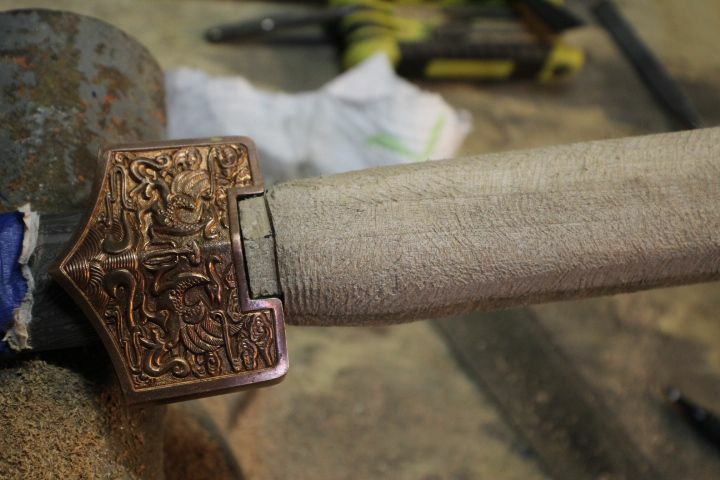 The sheath is fully polished, and now the scabbard slide and chape are attached. I just need to put a couple more layers of tung oil on it. 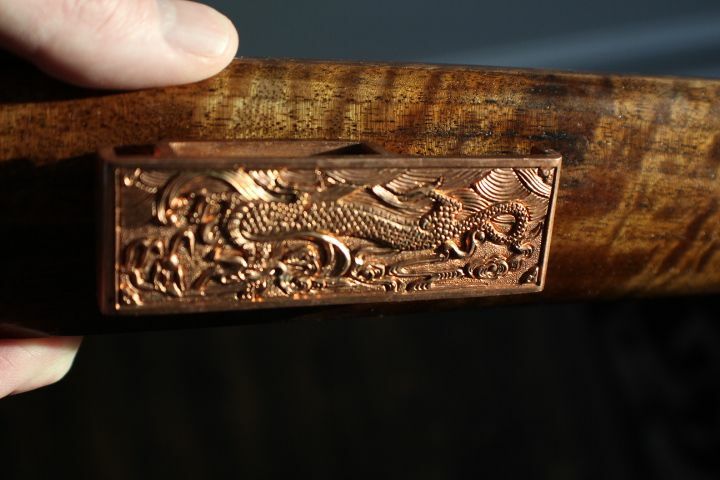 I also need to polish the handle, wrap some leather cord around the scabbard slide to make it more secure, do the final polish and etch, and epoxy and pin the handle. That is it. Not much, really. Thanks for looking. Will be done soon. Looks real good... I finally finished up Naginata. with a little help. that is very attractive steel and polish. Did you ever figure out why it was so hard at the back of the blade? thanks. 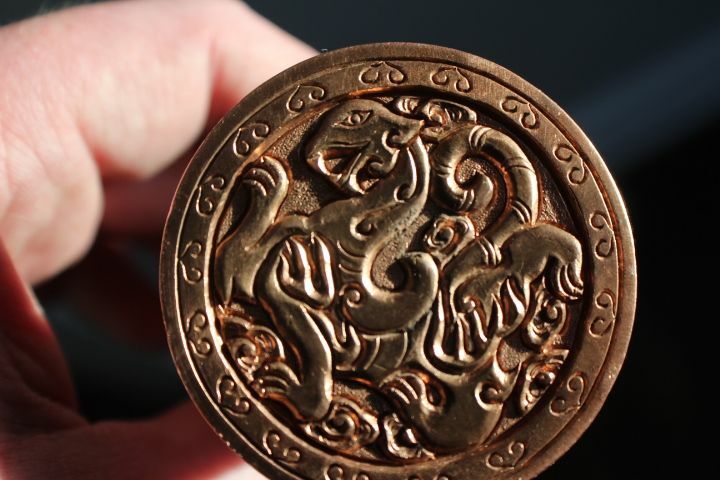 I still don't know why the back hardened as much as it did with a 1/8" layer of clay on it. Still, it obviously didn't harden as much as the front. 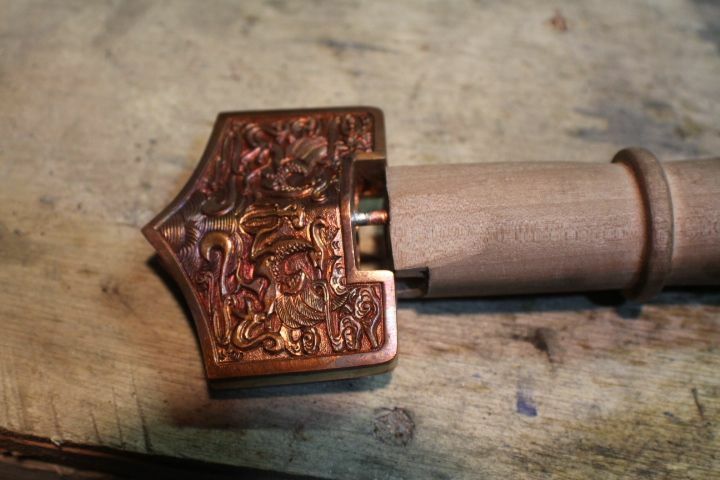 It may have had a lot of extra carbides (sort of like wootz) and therefore been hard. Heating would have balled them up some, and made the matrix softer, too. I have learned a lot since that blade. In fact, I was always going to just make another. I am a lot better at going slower now. Actually, I just appreciate more what goes into each step. It isn't that I am deliberately moving more slowly, it is that I see more complexity now so it naturally takes longer to get from point A to point B. Here is another set. 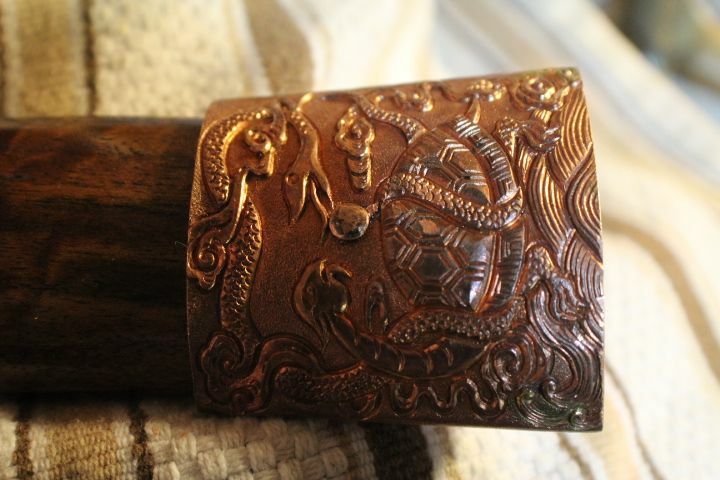 This will be the last one until I get the leather cord to wrap the scabbard slide. 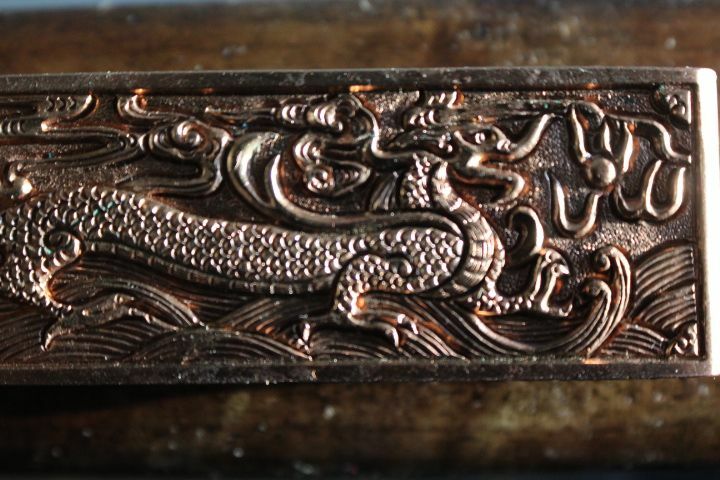 If there is interest, I will provide a link to a Smithsonian article called The Scabbard Slide in Asia (or something close). Here is a pic of the handle in place, but not pinned or epoxied. I am just looking to see if adjustments are needed. 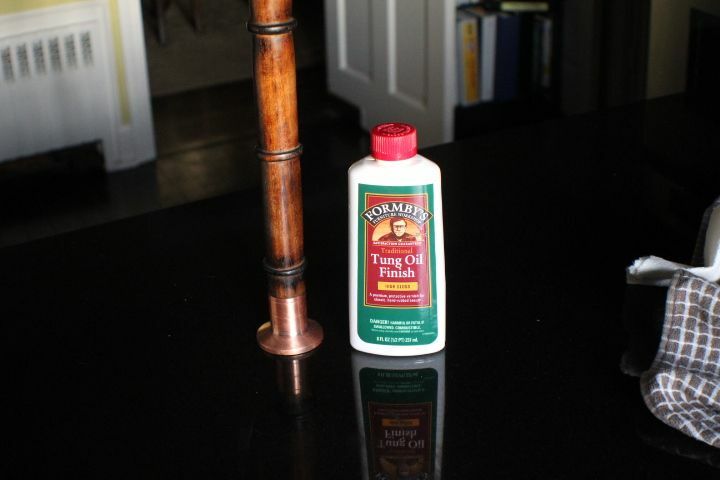 As you can see, I use tung oil. This stuff is great. Build it up slowly, in many layers. Wipe on, rub on. Let sit about 12 hours, repeat for several days. 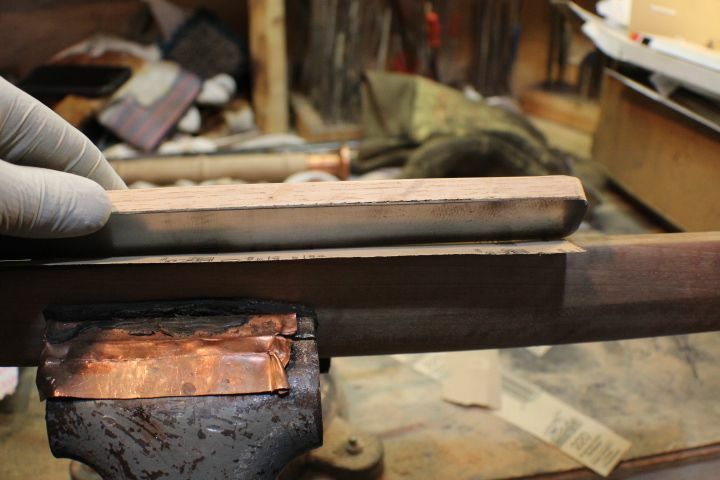 The sheath has a layer of tung oil that has filled the pores. 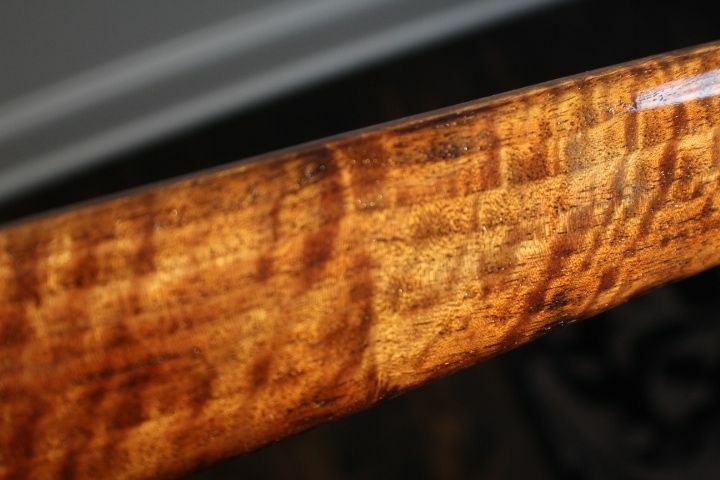 It looks a little like a CA finish, only easier to do, and historically accurate. Everything was stained with aqua fortis, which I learned from Alan, through this forum. I just buy Ferric Nitrate crystals and dissolve them in water. It is easier than nitric acid plus steel wool. This is some of the most interesting walnut I have ever seen. 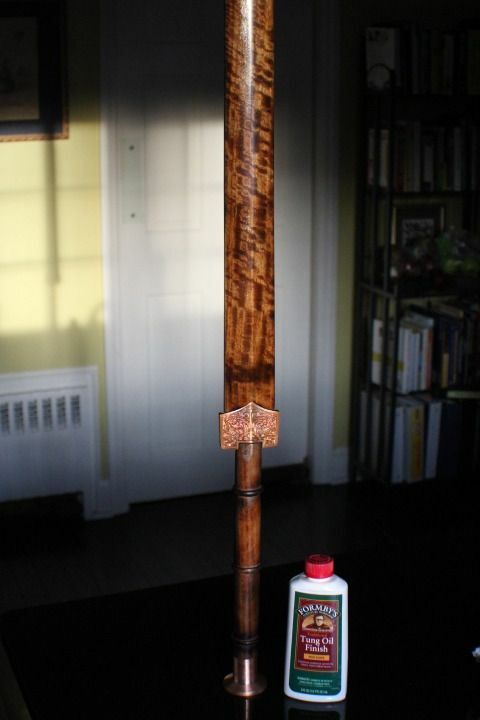 Tung oil and AF go together so very well. This is it until the leather arrives. Thanks for the kind words. There will be more when I get leather. Almost done, though. 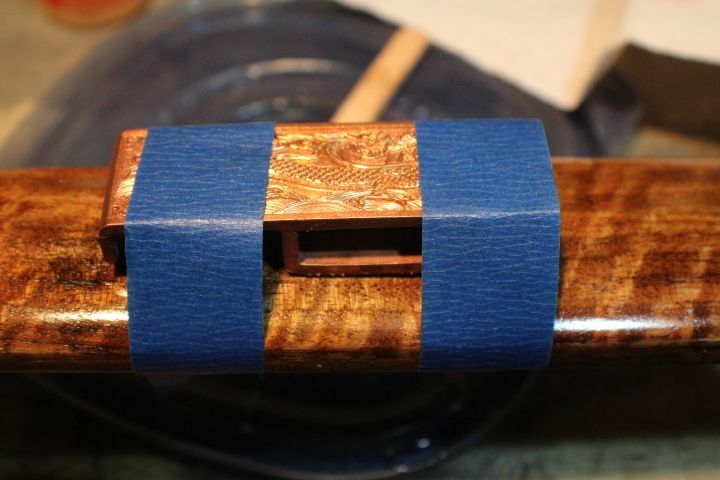 Wrap the scabbard slide with leather cord to help bind it. 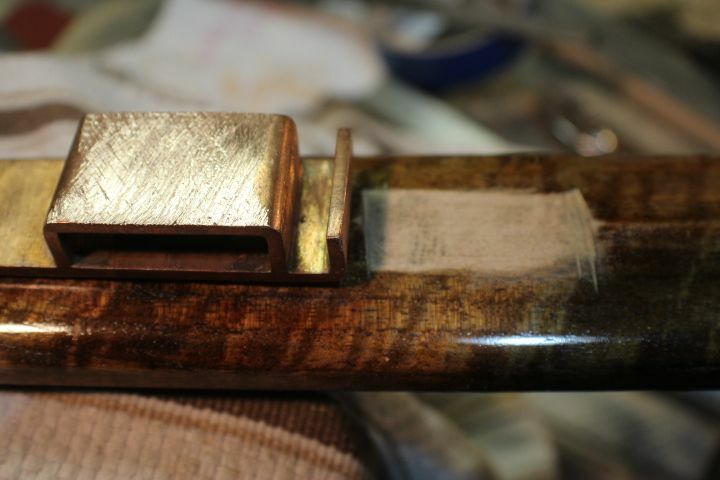 Then, sharpen, final polish, etch. This one is going to Coop. Here is the final sword. thanks bubba! Glad you noticed. I have gotten better. Still a lot of work to do, you know how that goes. WOW! Very good indeed Kevin (and Charles). Thanks Dan. 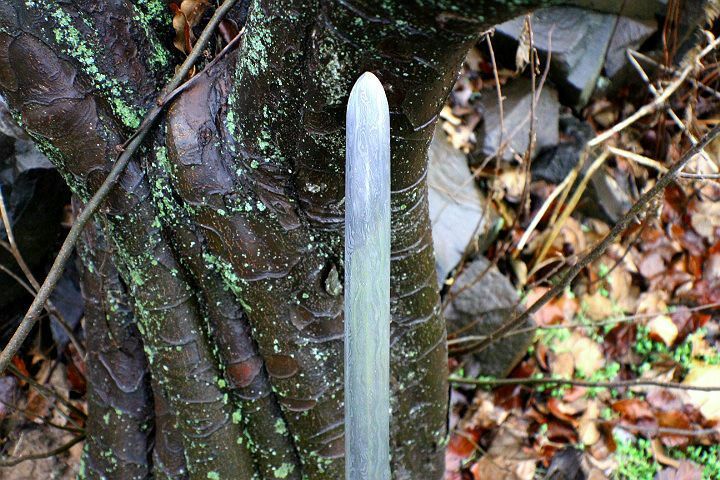 As you know, this was my first jian project, and it required 4 blades before I got it to the level I needed to match Charles's fittings. Nothing like a little inspiration. Looking forward to seeing you and Justin and other friends at Ashokan this year. 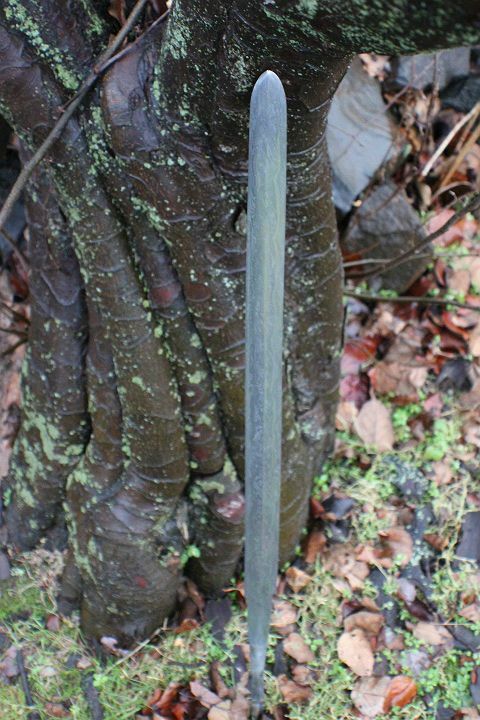 I have sold this sword, and ship it soon. This sheath is a long way from the cardboard and painter's tape I have been known to put around knives, isn't it! 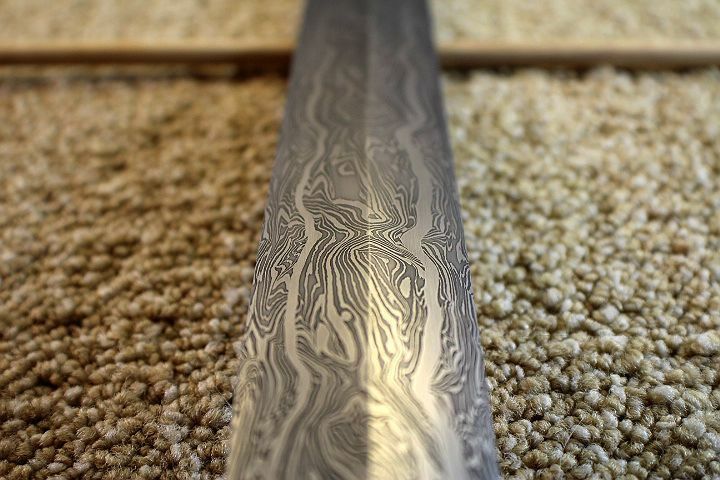 You still have the only blade I have ever completed from bloomery steel, by the way. I hope to change that this summer and Fall, but as of now it still stands.